Microsoft office home and student 2007 came with my computer. I need the key because I reinstalled windows and then upgraded to windows 10. Can I give you my service tag # and you could look it up for me? Thank you. The only location for that code would be on a card that shipped with the system - if you have lost that, you're essentially out of luck and will need to purchase a new license. Dell does not give out keys. The service tag will not help. 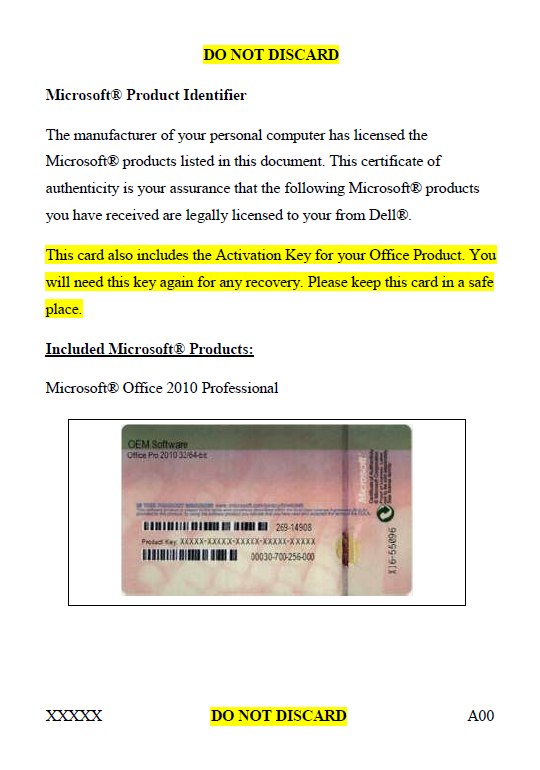 The MICROSOFT PRODUCT IDENTIFIER CARD has the KEY. This is true for Office 2000, 2003, 2007, 2010, 2013, 2016. You lose the key Card you have to buy office all over again.